Although winters in Korea can be harsh, the festivals, performances, and events occurring across the country despite plunging temperatures do not disappoint. 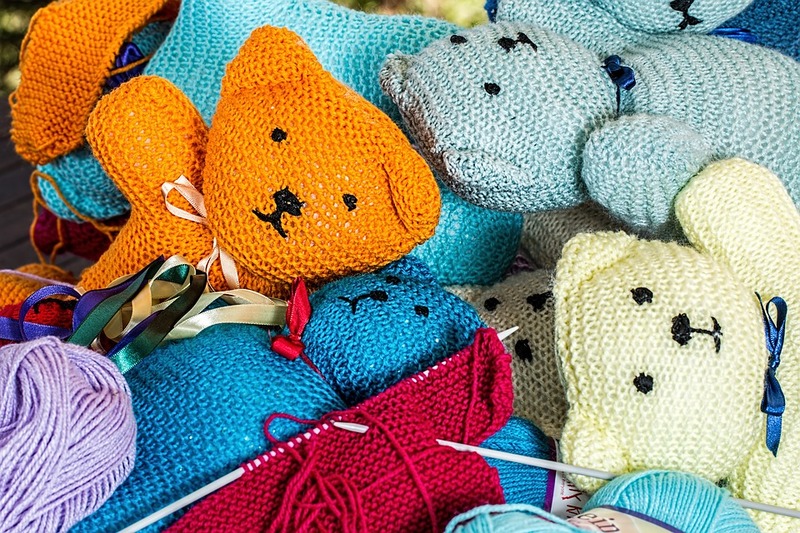 If you're wondering about Korean winter activities, then you have come to the right place! From markets to ice sculptures, sunrise festivals to sledding, there's plenty of things to do during the Korean winter. Those not afraid of embracing the cold can get outside with snow sports and ice fishing festivals. If you prefer to stay indoors you can also enjoy the pleasant sights in and around Seoul and go skating at indoor skating rinks. 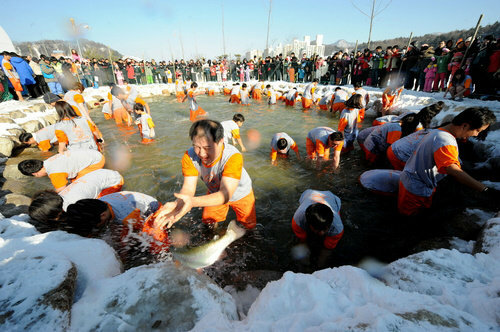 The Pyeongchang Trout Festival takes place during winter in the town of Jinbu-myeon starting in late December. Trout farming first started in Pyeongchang due to its cold, clear waters and has turned into an annual tradition that thousands of people flock to. Visitors to the festival can enjoy a wide variety of programs including ice and lure fishing for trout, sledding, top spinning, and sports such as riding 4-wheel ATVs, snow rafting, and sleigh trains. In one program you can even emerge yourself into ice cold water and attempt fishing for trout with your bare hands. Any trout caught from ice fishing and lure fishing can be prepared right away at a nearby restaurant and make for a delicious hard earned meal. One of Seoul's most beautiful ice skating rinks is none other than the Grand Hyatt. 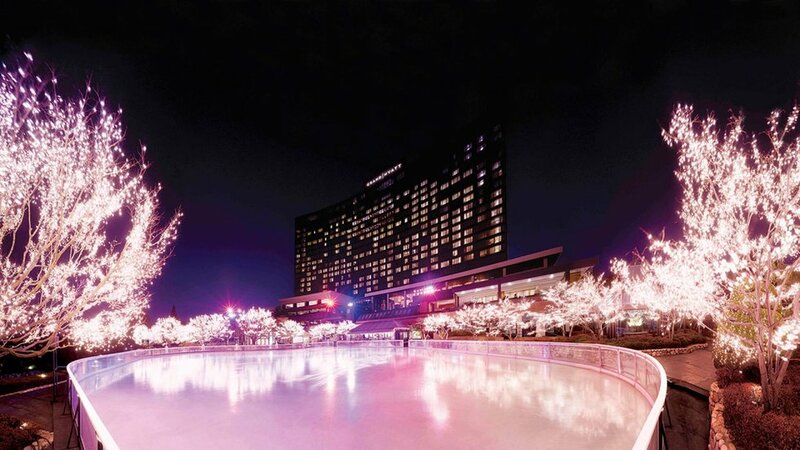 The Grand Hyatt hotel transforms their outdoor swimming pool area into a beautiful and romantic winter wonderland. This beautiful rink features twinkling fairy lights and decorated trees and is a go-to photo spot and date destination for couples. 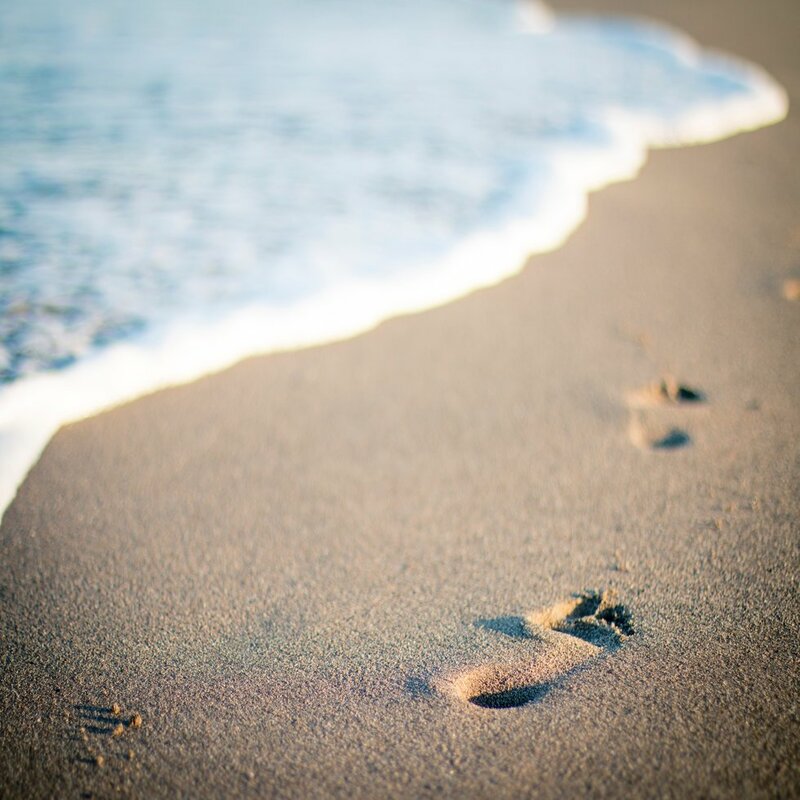 The lovely winter ambiance provided by the atmosphere makes it a popular winter date destination. If you'd rather enjoy skating indoors, another ice rink you may want to check out is the Lotte World Indoor Skating Rink. The small settlement of Taebaek has six months of winter on account of its elevation, and the town has converted it into the most fabulous winter fun. Snow sculpture exhibitions, snow rafting, dog sleds, and a very charming igloo cafe are some of the highlights of this lovely festival. The wonderful ice sculptures make Taebaeksan mountain all the more breathtaking and should influence you to add Mt. Taebaek to your Korean itinerary. 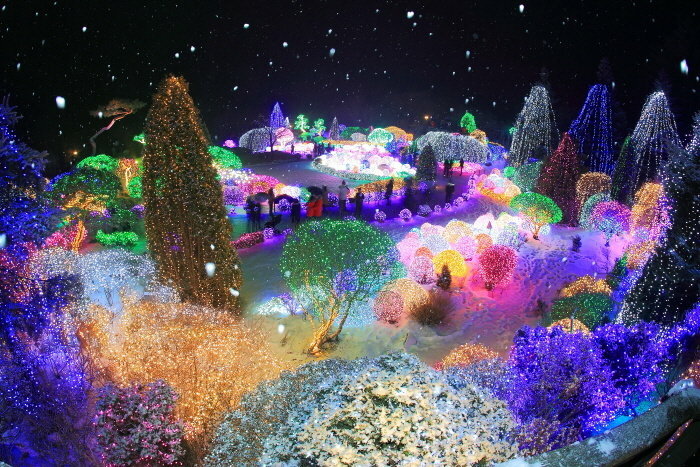 Held at the Garden of Morning Calm, the Lighting Festival is the biggest festival of lights in Korea and is illuminated by over 30,000 lights. The gleaming lights add a "festive glow to the garden during the winter season." The main gardens are Hakyung Garden, Hometown House Garden, Bonsai Garden, Moonlight Garden, Sky Path and Garden of Eden, with colorful lights adorning the trees. This garden of lights is a must see and will not disappoint visitors expecting to be wowed. If you're a ski or snowboard enthusiast, this one's for you. 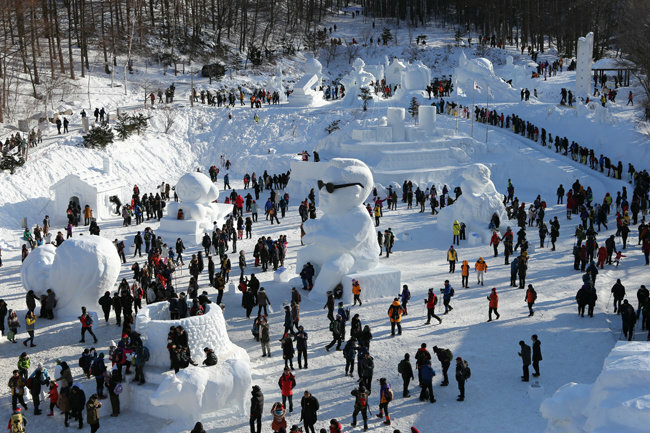 One of the most interesting places to visit in Korea during winter is Vivaldi Park. It turns into a ski-park in winters and attracts tourists to enjoy snowboarding and skiing. It has all the state-of-the-art facilities making it one of the most popular ski resorts in the country to spend a winter vacation. You get direct access to the snowy slopes and there are other leisure facilities in the resort for tourists to enjoy like a bowling alley, forest bathing site, and a bumper car. This attraction has been noted for being the most visited Ski resort in Korea for seven consecutive years. 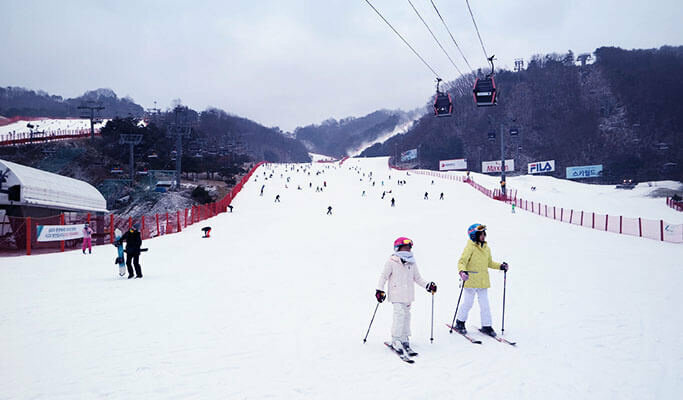 The resort is only 45 minutes from Seoul and is the closest and largest Ski area in the Seoul metropolitan region. 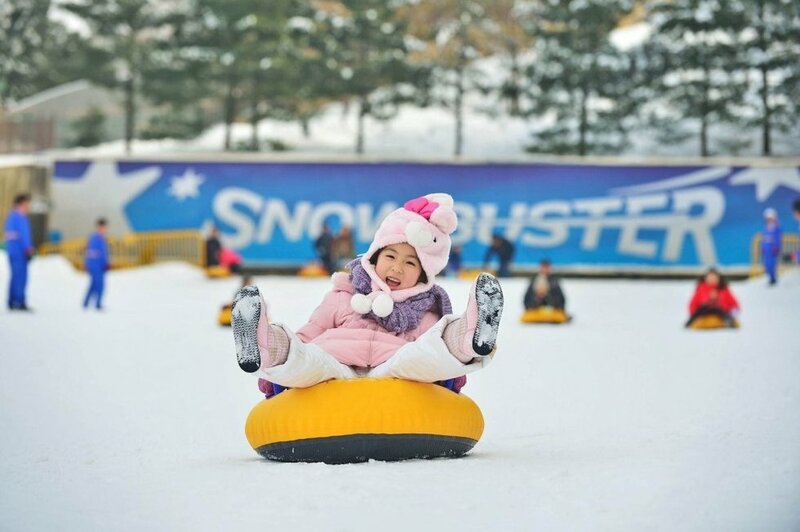 The 'Snow Buster' sledding hill in Everland during winter is a fun-filled attraction for families who don't ski and prefer a more laidback winter sport. The park provides the slope, the sleds, and the snow, as well as several other helpful facilities such as heated lounges and you also have access to the entire amusement park when you purchase an all-day ticket. Everland also installed a 'tube lift' for the 'Snow Buster', meaning you can sled to the bottom, climb back up to the top and do it all over again without getting tired. 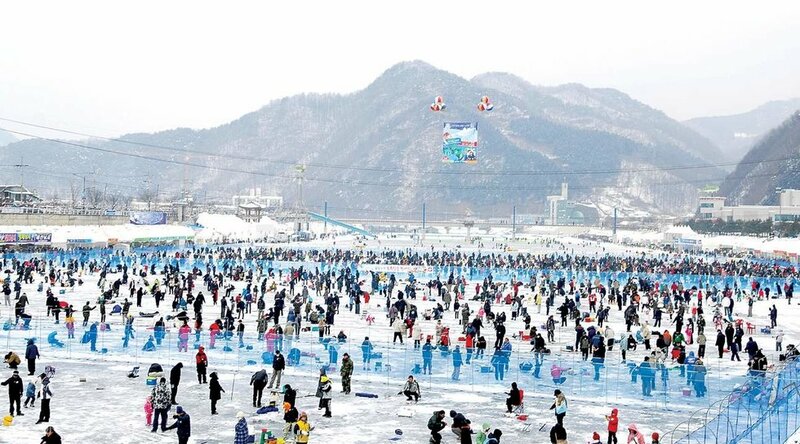 Hwacheon Sancheoneo Ice Festival takes place at Hwacheon county in Gangwon-do with plenty of snow and ice, making it the perfect place for a winter getaway. Since 2003, the festival has been visited by more than a million people, making this festival one of the most popular in Korea. There are various festival programs including ice-fishing, ice sledding, bobsledding and more. Fishing traditions are important to the Korean people, and each region has its own style of catching the local fish. This important and beautiful part of the culture is on display at this trout festival and is a perfect way to spend your winter vacation.